Riccardo Chailly leads his Concertgebouw Orchestra in a quality recording of one of Anton Bruckner's most immediately attractive works, the 4th Symphony in E-flat: good conducting, good orchestral playing and a good recording. Chailly's approach is a measured yet expressive interpretation which stresses the pastoral roots of the 4th without shortchanging the titanic and dramatic portions. If you wanted just one Bruckner 4th, this release will qualify. I found Chailly's interpretation of the finale particularly grabbing. One of the keys to successfully interpreting the 4th symphony, in my humble opinion, is introducing large-scale metric nuances. (Meter, different from rhythm, is the grouping of beats in music, usually in 2s, 3s and 4s. Large-scale meter is the grouping of the smaller sets of beats into a larger structure.) The 4th can be turned into a plodding experience in a poor interpretation, since one of its weaknesses is too-insistent meter. Bruckner himself seems to be aware of this pitfall because the Finale contains numerous hemiolas, in this case the use of three-beat patterns in duple meter. More than any recording I have heard, Chailly sensitively accentuates these cross-metrical patterns, one of this performance's distinctive successes. Another of the performance's strengths is the playing of hymn-like chorales, a typical Bruckner device. Chailly seems to have a particular liking for these chorales and presents stirring renditions of them several times in the 4th. One particularly memorable sequence is the solemn wind intrusion into the initial "Bewegt" (about 10 minutes into the 1st track). The disc was released in 1990, 4 years after Chailly took the helm of the Concertgebouw, an orchestra he still leads in what is one of the longest conductor tenures currently active. Sound quality is good, although not as good as the engineering Decca consistently provided Chailly in the rest of his long list of releases for the label. 5 stars. 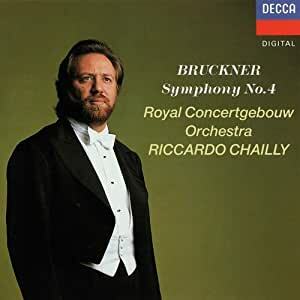 Riccardo Chailly's recording of Bruckner 4 with the Concertgebouw is an impressive performance. His reading, like Karajan/BPO, doesn't allow sentimentality to dominate the performance. It isn't cold. It's strong. I actually prefer, and think it is appropriate, for Bruckner's strength and intensity to be prominently displayed in performances of the 4th symphony as much as it should in his others. Yes, it's the "Romantic," but that isn't license to sachet through the piece as some do. Chailly's tempi seem perfect, and the music flows well through each movement. On many recordings of the symphony, my mind begins to wander in the slow movements. Again like Karajan, Chailly keeps my head in the music. I don't for a moment believe that any conductor of a world class orchestra tunes out during slow movements. I just believe that some are better at translating their oneness with the music to the listener. Karajan is supreme in this manner, and I highly value his performances. Chailly is very similar. It's simply a matter of intensity. The sound in this recording is excellent. The upper strings couldn't be sweeter. The brass have bite to them. Percussion is prominent when there. Tympani are well-heard but are not the last word in definition. Sonically, woodwinds could have been more prominently recorded. Soundstage is deep but laterally doesn't extend beyond the speakers. Those are my only quibble with the recording's generally superb sonics. When interpretation, performance, and sonics are considered, Chailly's 25 year old recording is still highly competitive and could justifiably be one's first or second choice. In a marketplace saturated with good Bruckner 4's it's hard to stand out from the crowd. And since this cycle has been out of print (in the USA) this 4th has long been sort of lurking on the outside of the Bruckner conversation for some time. Further obscuring things for me (and others whose experience with classical music doesn't predate the new millenium) is the fact that I've really come to know the work of Riccardo Chailly in reverse chronology, starting with his Leipzig stuff. Thus, exposure to his Leipzig Schumann (Mahler orchestrations = puke) and Beethoven (Hybrid HIPsterism at its most odious) caused me to avoid his Bruckner like the plague. The Nowak Edition is in use, so that means some really juicy moments - such as the timpani rolls at the climax of the great chorale of the first movement (used to great effect by Karajan in his DG recording), and those dubious but undeniably awesome 1889 cymbals - are missing. Like Nelsons' recent live recording with the Leipzigers, such an approach signals a more serene, contemplative 4th than, say, Karajan's or Tennstedt's. Chailly seems to be aiming, above all else, for beauty, lyricism, and majesty - a perfectly valid approach so long as it's underwritten by a certain quality of mysticism. His first movement is steady-as-she-goes, and like Karajan Chailly does not waste our time with false climaxes, but instead takes the long view, slowly building tension to the majestic peroration at 10:40. While this great moment will never be mistaken for Karajan's EMI (no timpani) or DG (timpani included - thunderously) cataclysms it's still stupendously beautiful. And although many conductors lose the thread of the opening movement after the chorale, Chailly is very skilled here at keeping the pulse going and linking up everything even with those pauses and gear-changes. The key, as ever, is subtlety, patience, vision, and grip. Chailly brings all of these qualities to the table. It's very effective. The second movement is one or Bruckner's patented traps for conductors. Skip through it too fast and without enough personality and it can sound bland and trite (Wand/Berliner, Bohm/VPO); the other extreme is Celibidache (who else?) who, unless you happen to be on his wavelength, can be punishingly boring (esp. in his Munich/EMI). Like Karajan and Wand, Chailly takes a moderate pace, but unlike Wand and very much like Karajan he gets the Concertgebouw to play with such character that the effect is poetic - even hymnlike. Again, Chailly has his eye on the end of the movement from the very start, and everything builds in intensity with a sneakily massive crescendo aided by just a hint of a rallentando just before it erupts at 13:10. It's not a violent climax, but elemental just the same. Majestic is really the word that seems most apt. If Karajan's Andante climax is like being blasted skyward by an erupting volcano, Chailly's is like watching the same phenomenon from a safe distance, in the thrall of nature's terrible power. The Scherzo is really the most impressive movement here. The wonderful balance and alphorn effect Chailly achieves is brilliant, and the peroration at 4:15, underwritten as it is by the thunderous timpani of the Concertgebouw, is as impressively done as in any recording I have ever heard. But where Chailly really sets himself apart is in the trio, finding the perfect, wistful tempo and nostalgia-tinged inflection in the strings that really makes this. It's rustic, graceful, enchanting - and totally (r)Romantic. Bruckner was certainly not known for eroticism, but this is a landler for lovers...come the return of the hunting horns and drumrolls there is a heroic, strutting quality to the playing...it's as if the trio was some sort of musical assignation and the music that follows is the triumphant stuff of post-coital bliss. Maybe I'm crazy, but this reading is the first time I've heard THAT in Bruckner...period. Three cheers for Chailly for bringing it off...maybe it's the Mediterranean touch? Moving on to the Finale - another pitfall for weak conductors - where we find Chailly at his most intense. Again, it's not Karajan, but it's damn rapturous just the same, and not without grip: the ascent up the mountain leading to the great blaze-up at 2:44-3:00 is a clinic in the long line as Chailly masterfully ratchets-up the tension and dynamics. Chailly seems also to have a knack for transitions, so nothing here feels episodic, another major asset in a Bruckner finale. The last 3 minutes are a journey deep into the wilderness, and the coda is full of mystical power. The Concertgebouw certainly needs no introduction, and their reputation as the best Bruckner band outside of Austria/Germany is well deserved. They sound outstanding here. The brass - my god - from the solo horn to the bass tuba, trombones and trumpets, everything sounds rounded and perfectly blended, but with enough grit at just the right moments (recapitulation of the Scherzo at 6:25, Finale climax #1 at 2:36). Indeed, one of the few faults I found in Nelsons' recent reading from Leipzig was the over prominence of the high brass in some of the climaxes. Here Chailly gets perfect balance and a burnished brass sound that is grounded closer to the bass line (in fairness to Nelsons, his recording was live, while this one was a studio job). Be that as it may, as great as the Concertgebouw players are, that sort of subtlety doesn't happen by itself. Nor is this reading devoid of interpretation - Chailly uses rubato with great subtlety, and his vision is clear in his mastery of pauses, transitions, tastefully executed rallentandos (in the Andante, in the Scherzo just before the recapitulation, and in the Finale) and in his ingenious use of the unique acoustical properties of the Concertgebouw to let the music wash over you, for example when he lets the echos of the horns reverberate - as if across mountaintops - after several of the grand brass fanfares. The engineering is as good as digital studio recordings get and a worthy example of the legendary "Decca Sound." Truly, this could be a demonstration disc: remarkable dynamic range, not a hint of glassiness, a deep, realistic (if not super-wide) sound-stage, stunning clarity, and excellent acoustics that take advantage of the dark, resonant quality of the Concertgebouw - just listen the decay of the the horns after the great fanfare climax in the Finale, 3:00 - 3:10...that's a great job by Decca in capturing the dark golden shimmer of this legendary hall. Where does this reading fit into the bigger picture? Well, there are a lot of great Bruckner 4th's. If the school of majesty appeals to you, I can't think of a better reading than this and it absolutely destroys other monumental/majestic readings, especially those foursquare efforts by Wand and Bohm; I daresay it even outclasses the recent live Nelsons from Leipzig. That said, if you favor pyrotechnics in your B4, you may gravitate to Karajan (DG or EMI - both are hot to the touch), Jochum (DG), or Tennstedt (London Philharmonic). A good middle ground between these approaches can be heard in Thielemann's recent live 4th with his Dresdeners, which is monumental, majestic, but with a healthy dose of Haasian apocalypto. In the right mood, Celi's reverie with the Munichers can take you to a higher place as well. Nevertheless, all successful performances of the Bruckner 4th, whether they go in for drama or for majesty, take aim at transcendence. These days, Chailly seems an unlikely candidate for such an enterprise, but here is the living proof: a golden reading trailing down the rivers of the windfall light.